Vegan Lettuce Wraps - easy and low-carb lettuce wraps recipe with tofu, mushrooms and veggies. A fun way to eat healthy. Many of my readers have been emailing me to request more vegetarian and vegan recipes on Rasa Malaysia. Even though I love vegetarian food but I just don’t make enough at home. Great news to my fans and reader who are vegans and vegetarians because you now have a great resource: Veggie Cravings. Hi! I’m Korie. I share with Bee’s love of cooking and I enjoy creating vegetarian recipes. Thanks to Bee for giving me the opportunity to share my vegetarian recipe with your fellow readers. I feel humbled and honored to be part of this fun-filled cooking movement. I am so excited that the Lunar New Year is almost here! Traditionally, the First day of the Lunar New Year is a time to celebrate with a nutritious vegetarian meal to purify and cleanse the body, and honor the Buddhist tradition. For this occasion I’ll be having lettuce wraps, swaddled with a medley of savory vegan ingredients. Light, tasty and low-carbs, the vegan lettuce wraps are a great way to start the New Year feast with families, friends and guests. 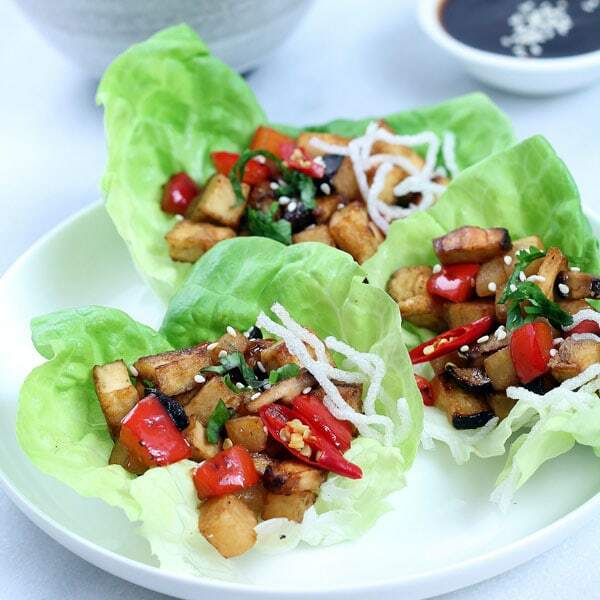 The vegan lettuce wraps we’re making are bursting with flavors of golden sauteed mushrooms, tofu, crunchy jicama and red peppers, wrapped in tender butterhead lettuce leaves. They are drizzled with a mildly spiced hoisin sauce, and garnished with fresh cilantro and crispy fried noodles for good luck and longevity! I hope you enjoy it as much as I do. Again, thank-you Bee for having me at your amazing site. Mix dipping sauce ingredients together in a small bowl and set aside. 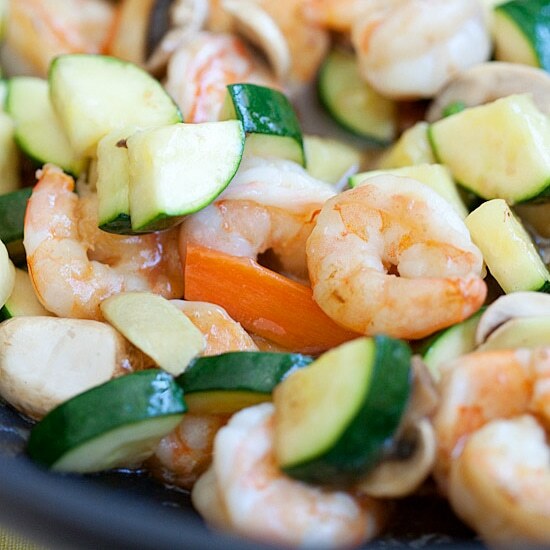 Mix seasoning sauce ingredients together in a bowl and set aside. Wash, dry and separate the leaves of 1 butterhead lettuce. Set aside. Heat skillet at medium heat, add oil and ginger. Stir fry for half a minute. Add tofu, shitake mushrooms, jicama and 1/4 teaspoon salt and stir fry for about 5 minutes or until golden brown. Add red peppers and seasoning sauce mix. Stir fry another minute, then transfer into serving bowl. Assemble wraps by spooning 1-2 tablespoons of filling onto the lettuce leaves, top with a teaspoon of dipping sauce, and garnish with cilantro and some fried vermicelli (optional). This will make about 8 wraps depending on the size of the lettuce leaves. You can find the fresh shiitake mushrooms in most Asian grocery stores. If not, you can use dried shiitake mushrooms by soaking them in warm water for 30 minutes, drain and then dice. Pre-fried tofu can be found in most Asian grocery stores. If not, you can use fresh firm tofu. 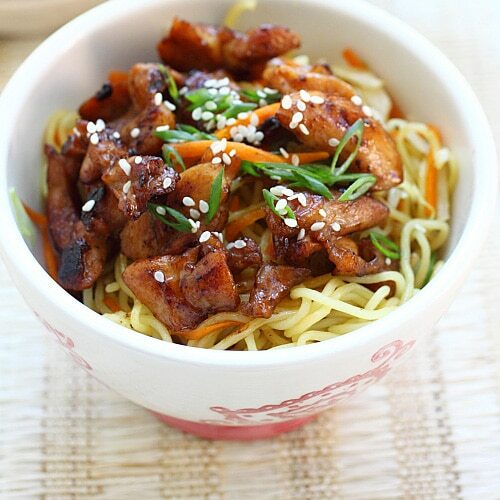 The vegetarian mushroom oyster sauce (http://amzn.to/1ZCC1rO) and mushroom seasoning (http://amzn.to/1SnEcen) can also be found in most Asian grocery stores. You can use either the vegetarian mushroom oyster sauce or the ABC sweet soy sauce (http://amzn.to/205TPbL) (both contain wheat so they are not gluten free). 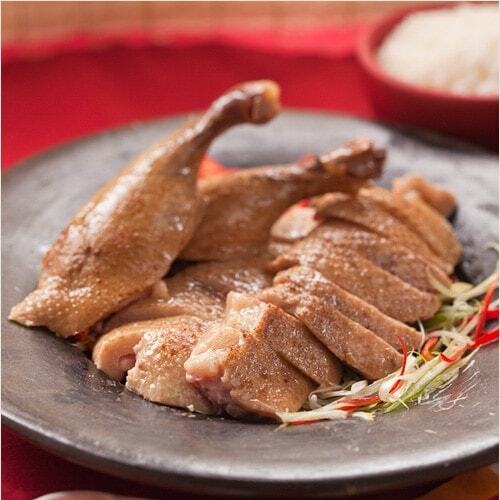 For a gluten free option, you can replace the same amount of mushroom oyster sauce with tamari sauce (http://amzn.to/205TFkD). The fried noodles for garnishing and are optional. You can prepare them in advance by deep frying some bean thread noodles (cellophnae noodles). All photos and recipes on Rasa Malaysia are copyright protected. Please do not use the photos and recipes without prior written permission. If you wish to republish this recipe, please rewrite the recipe in your own words instead of copy and paste and link back to //rasamalaysia.com/vegan-lettuce-wraps/. Thank you very much!